A sports-centric, immersive and interactive entertainment space, Smaaash is finally here for indoor gaming and virtual reality experiences. Have you been? 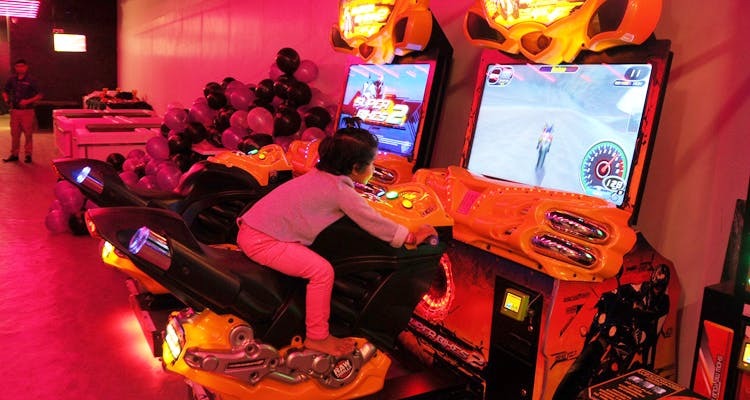 The brainchild of filmmaker and entrepreneur Shripal Morakhia, Smaaash is a gaming centre. And after quite a long while of keeping Bangalore waiting, the concept has made its way here, meaning that immersive sports experiences are here to stay! We’re super pumped about the Oculus Rift (yes, really!) enhanced games which will make sure that no real games will be the same again after you play these 360-degree immersive action games. Especially the Finger Coaster roller coaster ride and the super realistic Nitro Wheelie – a super bike simulator game. Just put on your helmet and rev it up! Oh! And how about bowling under snazzy UV lights? Yup, they’ve got that too! But if that isn’t your thing, maybe hitting off Wasim Akram’s Yorker or Brett Lee’s bouncers will keep you amused. Football too finds pride of place as you can have a shootout against any keep and pretend you’re Messi, Ronaldo or even good old Beckham. It’s the closest you’ll get to the real action, we promise. Don’t leave without hitting the X2 Motor Racing section where you’ll feel the real thrill of a Formula One driver, G-force and all, to really channel the glory days of Michael Schumacher. If however, nothing above has really caught your fancy, then fear not. The cocktails and bar nibbles will. Doubling up as a party spot too, Smaaash has a lounge area where you can catch up with friends over drinks and snacks, while groovy music plays in the background. Plus, a lemonade and dessert counter for kids! So, while it’s essentially a gaming destination, it is also all about relaxing and having fun. At least now the party animal, the gaming geek and the sports fan in the group will all be excited about the same plan! It’s powered by Star Sports and Sachin Tendulkar approves of it. Need we say more?